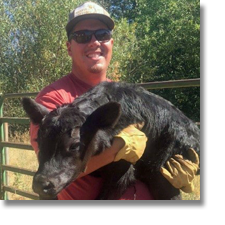 After graduating from California State University, Chico in May of 2014 with a Bachelor’s of Science in Agricultural Business Weston decided to move back home to the beautiful Sierra Valley to work on his family’s cattle and hay ranch. Roberti Ranch runs a fall and spring calving cow-calf operation, as well as produces alfalfa hay. Weston helps with the farming and hay side of the operation, but primarily works on the cattle production aspect of the ranch.